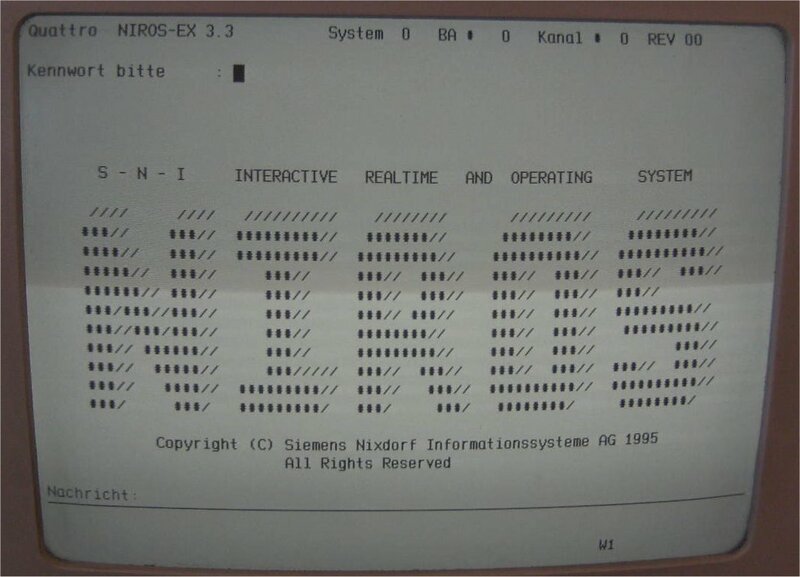 ​The picture on the left is a BA80 display showing the NIROS EX 3.3 log-on screen. The first version of NIROS that I can find any record of is 3.3 (not EX 3.3 just plain only NIROS 3.3) and was the first version I used. Over the years, it went through many enhancements and updates. I've listed some of the main millstones below and will be adding more as I discover them. Whilst looking for 8870 related info, I've posted many requests on chat boards asking for information; usually with no replies. However, one chap did comment on the origins of NIROS, and thinks it's based on IRIS. I'm yet to prove, or disprove this. However, if Nixdorf could use an external CPU design, why not an operating system. As would be expected with a complicated system like the 8870, its operating system NIROS had many releases and revisions. Nixdorf were actually rather good at creating and releasing documentation (for internal use only of course), and to make things simpler for those of us who needed to know what was going on “under the hood”, with every release or major revision they would print a new NIROS manual, but the manual only really contained changes from the previous release. This means that to get a complete picture of the 8870 you need a complete set of NIROS manuals and that’s not an easy task now. From what I know, this was the first version of NIROS to be available. I have a copy of the ORIGINAL version of this manual, and when I say original I mean the actual copy that the engineers and technical authors assembled for the publishers. In fact, it really was "cut and paste" as some of the diagrams had been drawn and then pasted onto A4 sheets that had all the text pre-printed. The preparation must have been done on a very old Word Processer and printed on a daisy-wheel printer. The manual is now available in English as well as German. I remember when the Nixdorf office in Manchester took delivery of an 8870/M55 SMD machine it had Niros 4.1 installed. One of the things I noticed as a BASIC programmer was that it was possible to "EDIT" lines of code. Thats right folkes, previously if you wanted to correct a program line or worse, made a mistake/syntax error during entry, you had to re-key the entire line. There were several revisions of 5.0 I think but I'm not sure what these revisions were for. I assume bug fixes. I have a NIROS 5.0/02 manual (in German) which I need to look at in more detail to see what changes occurred after 3.3. I've no specific information relating to this version yet. I do remember that at the time, this was felt to be a very stable version of the operating system. System Administrator Password: MULTI / TEAM (in the UK) without User Administration installed. Otherwise "NIX" and "DORF1" for UK built systems. This version was, in my opinion, the best version of operating system Nixdorf released to date and had several major new features. Firstly, it was configurable if there was an IDC in the system or not, and when there was, it seemed to handle it much better. Over the coming years, many customers would upgrade to IDC systems for the additional performance improvements and would have very few problems. Also, up to this point, all 8870s had been single CPU, but now the operating system supported up to four 1559-01 CPU's in the system. Each CPU could access up to 1 MB-words of RAM. Nixdorf also took the opportunity to enhance the system security with the introduction of "User Administration", but this wasn't activated by default. However, the user could elect to install User Administration and once enabled, it could not be removed. In simple terms, User Administration meant that you had to supply a User ID and Password to log-on and also allowed the user to change the standard passwords that Nixdorf supplied. This did have the negative knock on effect of making it very difficult for maintenance people to gain access to the system. As far as I know, all UK installations (that I'm aware of) had the a UserID of "NIX" and a Password of "DORF1" specified. Now I remember the release hype around 7.0 in the UK. The multi-processor support and performance boost was going to be a great selling point, and hopefully help persuade people to stay with Nixdorf a bit longer. However, we were told that you HAD to have the newer 1559 CPU. It came with either 512K or 1Mb of internal memory and was faster that the older 1537, and if you wanted to have a multi-CPU installation then the 1559 was a requirement. However, the M25s that have come into my possession were either running 7.0 or EX 1.0 and ALL had the older 1537's. Curious. System Administrator Password: NOOFFICE (in the UK) without User Administration installed. Otherwise "NIX" and "DORF1" for UK built systems.